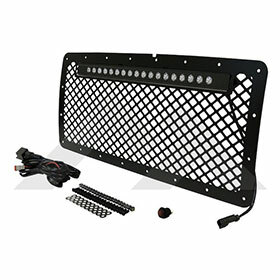 Aluminum Grille with LED Light Bar Kit. 1/4" CNC Machined Matte Black Anodized Aluminum Grille. Includes Grille, 20" Light Bar, Wiring Harness, Relay and Switch. Each Lamp Includes 18 Nichia LED's That Produce 7200 Lumens; 6000K Color. Each lamp Is Rated at 54 Watts / 4.5 Amps Draw at 12 Volts. 50,000 Hour LED Bulb Life; IP68 IP65 Rated For Shock Protection.